Minutes of Annual General Meeting held at The Tabernacle, Powis Square, Notting Hill, London, on Saturday 10h June 2017. Apologies had been received from Clem Cattini, Peter Knight, Pete Rochford, Andy Knott, Rob Humphreys, Alan Blackburn, Nicola Shilcock, Craig Newton and Ken Ledran Penrose. Minutes of last AGM held at The North Library, Islington on Saturday 11th June 2016. The minutes had been posted on The Society’s website and copies were circulated to the members present, and were agreed as a true account of the meeting. The meeting commented on the very successful 50th Anniversary gig held on the 3rd February 2017 at Waltham Cross and wished to record its congratulations to Pete and Shy Rochford for their hard work in staging the event from which £2280.00 was raised for The Newent Dolphin Centre, the chosen charity of the Meek family. It has been a fairly steady for JMS. The Society continues to thrive and there is still a great deal of interest in all things Joe Meek / RGM – related. As Chairman, I rely greatly upon the support of those committee members who work so hard on our behalf. The vital JMS Website – which is run brilliantly and efficiently by Rob Humphreys. The JMS Facebook page – again run brilliantly by our former chairman Craig Newton. In this Internet Age, a strong JMS presence online is vital. Rob and Craig put in an enormous amount of work on our behalf and I thank them both profusely. When I became Chairman – I was delighted when our then former treasurer David Nevols offered to take up the reigns once again. Being treasurer involves a tremendous amount of work – as I recall when I used to do it. Well, David is incredibly organised – and his experience in financial matters is invaluable. David does an enormous amount of work on behalf of JMS, for which I am extremely grateful. Furthermore, following on from a lot of stress involving the organisation of the 2016 AGM – it was David who pointed out that the position of JMS Secretary had lapsed. David selflessly put himself forward to fulfil this role – and he has been utterly brilliant. I should also like to thank Gretel for supporting him in these very important roles. There has been continuing interest in our Back Issues dept. this year, resulting in work for Steve Nash. He has (aided by his wife Kait) responded superbly, so many thanks Steve. I would also like to thank Darren Vidler for continuing with the JMS DVD service. It is a huge help, so congratulations to him for stepping up to the plate. My thanks also to Ray Liffen and ex – chair Ken Ledran for their continued advice, support and general help. Where would we be without our membership secretary Andy Knott? As well as maintaining the membership list, he has the unenviable and laborious task of packing up and posting out our publications six times per year. It is a thankless task, a monumental one and a vital one. Thanks Andy. I should have said earlier that both Rob Humphreys (in particular) and Andy in general also make the treasurer’s job a lot easier between them. Two more committee members to thank. Firstly, Mark Newson. “Thunderbolt” is very highly regarded. Producing each issue is a genuine labour of love and Mark literally spends hundreds of hours working on it. Such dedication (all for free) is truly rare in this day and age. Mark also has contacts with so many people. His knowledge is vast. Mark was originally going to stand down in February 2017 – but he has amassed so much research material, that he will now continue with Thunderbolt until this October. Nicola Shilcock. Nicola is so modest, but she works tirelessly on the Society’s behalf. I do not know what I would do without her skills (layouts etc) and contributions towards the JMS Newsletter. She makes every issue better and she saves the Society lots of money. Finally, we have people like the amazing Alan Blackburn (the only person to have actually heard all of Joe’s surviving ‘Tea Chest Tapes’) to draw upon, not to mention Clem Cattini and of course, Sandra Meek – Williams. They are all unstinting in their support of JMS and I know that Sandra appreciates everything that we all do to keep Joe’s memory alive. JMS has supported several students on Music / Media / Sound Recording courses doing research into Joe Meek / RGM Sound, including PhD students. Both Ken Ledran and myself have been on Radio Caroline, with Joe Meek / RGM – related themes. Member & DJ Colin James produced several Joe Meek / RGM – themed shows for Radio Sutch. Absolutely first – class they were too. Pete Rochford’s Joe Meek 50th Anniversary Memorial Show featured several former RGM Acts as well as the Triumphs and raised £2,280 for a charity which Joe himself championed 50 years ago and to which Sandra Meek – Williams is still connected. There was a Joe Meek evening at the BFI organized by JMS member Vic Pratt – who is a senior figure at the BFI. “It’s Trad Dad” (featuring various RGM artistes) was shown, along with “The John Leyton Touch” and a colour film of a wild, zany staging of “Jack The Ripper” featuring Screaming Lord Sutch. I was on Radio Solent, talking about Joe and the 50th Anniversary of his death. On behalf of JMS I spoke to journalists / PR people / production assistants / researchers etc., etc., connected with the BBC Music Website / Radio 2 / Radio Gloucestershire / Radio Berkshire / BBC Points West and so on. I have been liaising with artist Julie Rose Bower on an exciting project to do with the National Trust and English Heritage which, I am sure, will reap huge dividends for Joe Meek’s memory. Unconnected directly with JMS: Adrian Kerridge’s book is now published, Malcolm Lenny will have a book out shortly, Howard Berger’s “A Life In The Death Of Joe Meek” will supposedly gain widespread release this year and Mike Berry will once again be touring with Marty Wilde. Finally – I have enjoyed my spell as JMS Chairman & I would like to thank everyone who has supported me. As anyone who has fulfilled this exacting role will testify, it is not always ‘a bed of roses’. I never set out to become JMS Chairman. I only took over when Craig Newton sadly felt obliged to stand down and there was no – one to replace him. I was glad to be of service, but it was never my ambition. I am very mindful of JMS history – so I am honoured to now join that esteemed, but small, group – ‘Former JMS Chairman’. I pay tribute to my predecessors: John Repsch, Norman Thompson, Ken Ledran and Craig Newton. My thanks to them for their sterling service to JMS and I wish my successor, Pete Rochford every success in the role. The most welcoming aspect is that membership numbers have risen marginally over the past 12 months resulting in slightly increased subscription income. 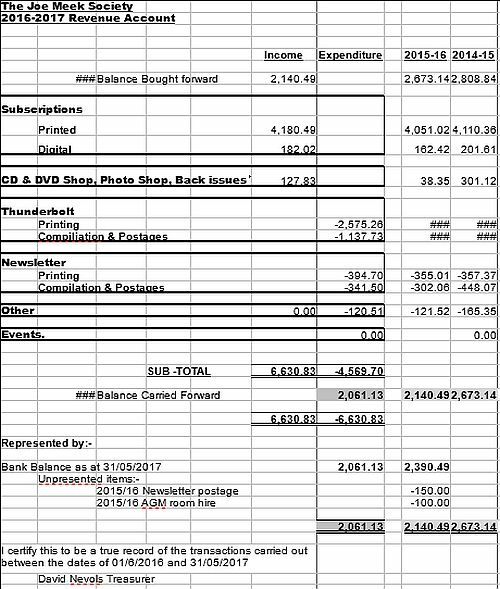 On the other side, printing costs have remained stable and other costs have been contained where possible resulting in much the same retained balance as last year. On the face of it therefore we are trading at a breakeven level and that, for a non-profit making organisation, is great. However closer examination of the figures show that some areas are subsidising others and I believe that should now be addressed. Current subscription levels have remained stable for an incredible 6 years now. How many of your other bills can boast that? I suspect none. Through ongoing prudent management of the Society, I am pleased to say that UK subscriptions can be maintained at £17.00pa, but an increase must be considered for our overseas members due to significant changes in exchange rates and increased postal charges. We are not yet sure of what the longer-term effect post Brexit and indeed the General Election will have on exchange rates. Over the past year US rates fell from 1.44 dollars to the pound to 1.28 today and for Europe from 1.27 Euro to the pound to 1.14 today. Hence the costs of providing our publications to our overseas members are not being fully covered at present subscription levels. For European members, our current rate is £21.00pa but present costs run at about £27.00pa. For Worldwide members, the figures are £25.00pa and £32.00pa respectively. The plus side to this is that we are not talking big numbers. We have 18 European and 6 Worldwide members so the overall subsidy is £150.00. I am sure we would not wish to lose our valued overseas members as they “spread the word” about Joe beyond our shores, so I would be happy to hear your views on the way forward. We can leave things as they are, implement the full increase or compromise somewhere in-between. As Treasurer, my recommendation would be the latter, say £25.00 and £30.00 respectively. All my calculations are based on current, known costings and although there is a potential for significant cost savings in the future due to the possible computerized typesetting of Thunderbolt, such savings are difficult to forecast. If they are achieved, there may well be the scope to review all subscription rates next year. All my figures are available for scrutiny should you wish to go into more detail, and any questions are welcomed. As always, I would like to record The Society’s thanks to Catford Print Centre who have continued to provide us with an excellent product, and my personal thanks to all the members of the Committee for their help over the past year. Special thanks as usual to Rob Bradford and Andy Knott with whom I have most contact financially, but also to Mark Newson, Steve Nash and to Rob Humphreys in sunny Spain (jealous?…yes) for his considerable help in computer matters last year. A proposal for the Financial report to be accepted was received from Ray Liffen and seconded by Steve Nash and was passed unanimously. It would be safe to say that bit has been a rather lean year for new members since the 2016 AGM and there are numerous reasons as to why this should be – lack of TV and radio exposure or lack of any new and previously unheard RGM recordings being, I feel, the main obstacle to this. I have noticed over the years after any Joe Meek event the Society or anyone else stages, it has produced a deluge of membership applications and so it continues to be the case. However, there is obviously still a keen interest in Joe and his work which has kept our membership levels fairly constant for the last couple of years and like any other society, membership totals have peaks and troughs over the course of time so on behalf of the JMS Committee, may I thank the members for their continued support. I would also like to extend my gratitude (as always at this time) to those members who very kindly send extra donations with their subscriptions, all of which greatly helps with the finances – you know who you are so many thanks indeed. My personal thanks, as ever, go to my fellow committee members for all the hard work they do in keeping the society ticking – Mark for the Thunderbolt, Rob for his work as Chairman and Newsletter Editor, David for keeping the finances in check, Rob Humphreys for the website and Paypal payments and Steve Nash for his help with back order issues. All in all, we can be proud of ourselves in keeping Joe’s name in the limelight and hope that the coming year will once again provide more exposure for Joe and his unique talent. It has been a quiet year on the website, quieter than for some time. New members joining online have decreased (in both paper or digital format). I guess this is just a fact of life but I thought the 50th Anniversary concert would have stirred new interest. But we still get interesting queries via our website contact form and there are still (unknown to us previously) people who recorded for Joe who wonder if their tapes are still in the tea chests. Following a general discussion between the members present, it was agreed to enrol two further legendary Joe Meek artists, Charles Blackwell and Malcolm Lenny of The Packabeats, to the Hall of Fame. It had been known since the last AGM that Mark Newson would be stepping down from his position of Thunderbolt editor although he had agreed to continue until a replacement editor could be found. After one successor had to unfortunately withdraw due to health reasons, Chairman Rob Bradford agreed to take over. This however has had a knock-on effect of Rob deciding to resign from the Chairman’s role to concentrate his energies on producing the Thunderbolt as well as the Newsletter. Pete Rochford had expressed an interest in taking over as Chairman and with no other applicants his election was unanimously agreed by the members present. The Twitter Admin officer Denis Hoare has now left the Society and the position now falls vacant. No nominations to fill the position had been received at the meeting. All other Committee members had volunteered their services for a further period and were re-elected en-bloc. Amendments to The Society’s constitution. This has not been the case for a number of years and a proposal was put forward to remove the location and date and for such matters to be at The Committee’s discretion. The proposal was put forward by Rob Bradford and seconded by Steve Nash and was carried unanimously. David further pointed out that Rule 6 regarding The Accounts, was also out of date as it required The Society’s bank account to be opened at Lloyds Bank, 302 Holloway Road. This branch no longer exists and our accounts have been maintained by HSBC for a considerable number of years. David continued to mention that the constitution required the annual accounts to be audited, which had never been done although in future, Ray Liffen has agreed to conduct the audit. The whole matter of The Society’s Constitution would benefit from updating and this will be completed for acceptance at the next AGM. Date and venue of next years Annual General Meeting. The meeting discussed possible venues for next year’s AGM and it was decided to re-visit Newent, Joe’s Birthplace, and a date was set for Saturday 9th June 2018 and to be held at The George Hotel. There being no other matters put forward for discussion, the meeting was closed at 4:11pm.